In June of 1979, Channy arrived in Lincoln Nebraska as a refugee. After four years of no school and not knowing a word of English, she attended Lincoln High School; earned a Master of Science in Applied Mathematics from Santa Clara University and undergraduate degrees from the University of Nebraska-Lincoln. Channy worked in Silicon Valley as an engineer in the Aerospace and Biotech industries for 30 years. 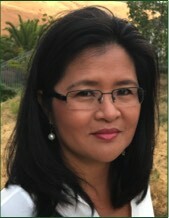 As a strong supporter for women in engineering, Channy has been a board member of INCOSE (International Council on Systems Engineering) and held office as president of INCOSE Bay Area Chapter. Channy now works with schools and other organizations to promote awareness of what happened in Cambodia and to inspire refugees in adapting to their new country. Her efforts focus on motivating and empowering them to reach their full potential. Channy is married to her college sweetheart, they have two children Natasha and Richard. Channy is living in Fremont CA with her husband Kent Laux. She is passionate about cooking, dining, and entertaining friends. She is the author of Short Hair Detention and owner of Angkor Cambodian Food.